Home » GBP » Pound Sterling to Thai Baht Exchange Rate Forecast: Will UK GDP Growth Push GBP/THB Higher? Pound Sterling to Thai Baht Exchange Rate Forecast: Will UK GDP Growth Push GBP/THB Higher? Pound Sterling (GBP) has risen by 0.5% against the Thai Baht (THB) today, hitting a two-week interbank exchange rate high of THB42.8580. This appreciation comes from signs that there could be a resolution to Brexit talks in the next two weeks, which have boosted optimism among GBP traders. In the coming week, the Pound could make additional gains against the Baht when UK GDP data is released on 10th October. The reading for August is tipped to rise from 0.3% to 0.4%, although some economists are taking an opposite view and anticipating a slowdown to 0.2%. If the GDP reading grows instead of falling then the Pound could rise further against the Baht on GBP trader optimism. Beyond next week’s UK GDP data, the Pound to Thai Baht exchange rate (GBP/THB) could also be affected by UK wage growth data out on 16th October. Current expectations are for a slower pace of wage growth to be reported for the reading excluding bonuses, which might lead to GBP/THB losses. Falling UK wage growth raises the risk of inflation overtaking the pace of earnings, which can cause wage squeeze conditions. Among other problems, reduced real incomes can lead to a lower consumer spending and falling retail sales, which can ultimately impact GDP growth. 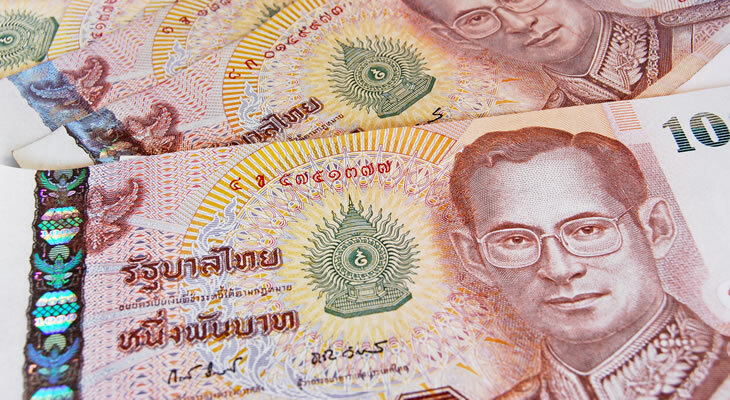 Thai Baht to Pound Outlook: Are THB/GBP Exchange Rate Gains ahead on Trade Balance Data? The Thai Baht (THB) has recently fallen against Pound Sterling (GBP), with the latest Thai economic data failing to excite Baht traders. This has included 4th October’s consumer confidence data which showed a small dip for September’s reading. More recently, Baht demand has also been reduced by news of a falling Thai foreign currency reserves. September’s reading has revealed a decline from 205.5bn to 204.5bn, which has pushed the Baht further down against the Pound. Looking ahead, the next economic data that could influence the Thai Baht to Pound exchange rate (THB/GBP) will be trading stats out on 22nd October. September’s figure is expected to show a rise from the previous deficit of -0.59bn to a surplus of 0.3bn. Such a result could boost Baht trader confidence and push the THB/GBP exchange rate up; this is more likely if a larger-than-expected surplus is recorded. Will Thai Industrial and Sales Stats Trigger THB/GBP Exchange Rate Rise? Later on in the month, the Thai Baht to Pound (THB/GBP) exchange rate could also be supported by industrial output and retail sales stats out on 31st October. A sharp rise in year-on-year industrial output in September has been forecast, in the form of a jump from 0.7% to 3.3%. The trio of retail sales figures could also cause a THB/GBP exchange rate rise, assuming that they show a faster pace of sales growth compared to previous readings. Previous ArticlePound Mexican Peso Exchange Rate News: How Has Mexico’s Central Bank Rate Decision Impacted GBP/MXN? Next ArticlePound Euro Forecast: Will GBP/EUR Exchange Rate Slide on Falling UK GDP Figure?